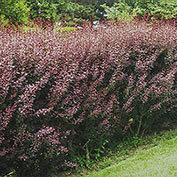 Rose Glow Barberry is an attractive shrub that works well as a specimen plant or hedge. 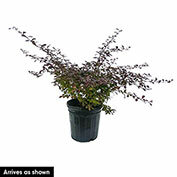 This deciduous shrub grows 3-6 ft. tall with a similar spread. 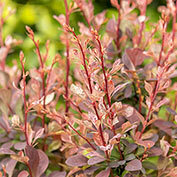 Its leaves have red-purplish hues and turn shades of orange, yellow and red in the fall. It produces bright red berries that birds like to eat. Grows best in full sun. Available in a gallon pot and shipping now. Potted. Zones 4-8.